American wildlife ecologist Craig Downer says wild horses and donkeys can make valuable contributions to Australian ecosystems in many different ways. He described them in this poster presentation at the Ecological Society of Australia annual conference in 2014. Wild horses can complement an ecosystem, or life community, in many direct and obvious as well as more subtle ways. This they do when permitted their natural freedom to move and interrelate over a sufficiently extensive intact habitat and time period. Equids possess a caecal, or post-gastric, digestive system. This enables them to take advantage of coarser, drier vegetation and, through symbiotic microbial activity, to break down cellulose cell walls to derive sufficient nutrients from the inner cell without overtaxing their metabolism. In drier regions, this can give equids a distinct advantage. Consumption by equids of coarser, drier vegetation can greatly benefit sympatric, pre-gastric (ruminant) herbivores, and energize and enrich the ecosystem as a whole. By recycling chiefly the coarse, dry grasses as well as other dry, withered herbs, forbs and bush foliage, the horses and burros expose the seedlings of many diverse species to more sun, water and air, thus permitting them to flourish. The latter can then be consumed by ruminants (see R.H.V. Bell 1970). Equid feces lend more sustenance to decomposers and food webs that involve mutually sustaining exchanges among all classes of organisms. The latter include many diverse insects, birds, rodents, reptiles, etc. This could help bolster many native species in Australia. The less degraded feces of equids contain many more seeds that are intact and capable of germination and from many more types/species of plants when compared with ruminant grazers. Thus, the horses’ wide-ranging lifestyles can greatly assist many plants, including Australian natives, in dispersing far and wide and, so, in filling their respective ecological niches. This enriches the food web and allows a greater diversity of animal species, including Australian natives. A little-recognized fact is that the wallowing habit of wild equids creates natural ponds whose impacted surfaces become catchments for scant precipitation or summer cloudbursts. These provide a longer-lasting source of water for a wide diversity of plants and animals. This can even help to create an intermittent riparian habitat for desert amphibians and many other desert species including those of the Australian Outback. Ephemeral plants that quickly flower and set seed, including many composites, are benefited from these catchments – especially valuable in regions with clayey soils. Wild horses are natural prey of certain carnivores and omnivores including in Australia dingoes, crocodiles, and wild dog packs. Wild horses and donkeys are well suited to life in arid and semi-arid ecosystems. One reason is obvious: their great mobility. With their long limbs and sturdy, single-unit (soliped) hooves, they are made for movement. In such semi-arid or arid regions, this extensive movement is vital for survival. In order to obtain enough forage, a wild horse must often roam over several square miles each day, selecting appropriate plants to prune; reaching a water hole may involve traveling over a hundred-mile round trip in a grazing circuit of two or three days. Wild horses do not camp on riparian habitats as do cattle. During very hot, dry spells, a wild horse band must stay close to water, tanking up every day with about 10 to 12 gallons for a mature horse. A spring can be shared by several bands. These form an orderly hierarchy for watering should more than one band arrive at a source at the same time, often late in the day. When melting snow or fresh cloudbursts paint the land with ephemeral water sources, wild horses can disperse into areas further away from perennial lakes and streams and to these ephemeral sources. Here they employ their keen sense of smell in detecting even very small and hidden water sources. They can also negotiate rougher, steeper, and rockier terrain than domestic cattle, and prevent flammable vegetation from building up there. The horse’s post-gastric digestive system does not emit as much gas as is the case with pre-gastric ruminant grazers, and permits them to greatly reduce dry, fire-prone vegetation over vast areas without overtaxing their metabolism. Thus, they help to prevent catastrophic fires that global warming, or more to the point, human civilization’s pollution of the atmosphere, is causing. By drying out vegetation and provoking catastrophic fires – rampant in western and southern North America, Australia, and much of the world – the catch-all “global climate change” threatens planetary life as we know it. This will especially be the case if global ocean currents stop circulating because of glacial and ice cap melting, etc. Wild equids can greatly help to save the day if allowed to play their own special role in reducing flammable vegetation, in building soils, in seed dispersal, in preventing catastrophic, soil-sterilizing fires, etc. They stand ready to counter imbalances brought on by human civilization and its contamination of the atmosphere, much of which is caused by hordes of domestic livestock (de Haan et al. 2006). Equine feces aid the watershed by creating damper conditions, because the soil particles to which they reduce (micelles) retain more moisture, i.e., more water adheres to the surface area of these particles. Hence ground water tables are replenished, feeding more seeps and springs more continuously. And upon these springs and seeps, many species of plants and animals depend. Some fire is of benefit to an ecosystem, but fires that over-consume, over-extend, and over-intensify can set the evolution of a terrestrial life community way back and result in a very sterile environment that could take thousands of years of “peace” to recover. Equids possess both upper and lower incisors that permit them to selectively nip pieces of vegetation, such as grass or the leaves of bushes or trees. Major ruminant grazers such as cattle and sheep do not have upper incisors and consequently can and do rip up plants by their roots more frequently with the action of their lower teeth and tongue against their hard upper palates. This often exposes soils to destructive wind and rain erosion, especially when too many of the ruminants are placed upon any given area of land. And wild horses are much more mobile in their daily and seasonal feeding rounds than are cattle. Equid species diversify and strengthen the community they inhabit in a variety of ways when allowed to achieve population stability over time and when not over-imposed upon by humanity. The process of natural selection must be allowed to operate sufficiently long for this to be the case. Then these equids can and do create a greater variety of environmental conditions that make possible a greater variety of niches that can be occupied by the species that are coevolving with them. Being large, powerful animals, equids can push their way through thickets of brush to form trails. Specifically, they open thick vegetative understories to light and air, and the more diverse exposures resulting from equine activities create conditions intermediary to the extremes of wind, temperature, and various soil conditions. This physically defines a greater variety of niches fillable by a more diverse array of species. When allowed to integrate into wilderness, the individual life histories of wild equids come to reflect natural oscillations, such as annual seasons and more long-term cycles. This they do along with the plants and animals that share their habitat. They harmoniously blend over time. As large animals that eat relatively large quantities and disperse their grazing and browsing activity over broad areas as semi-nomads, equids can become the harvesters and the renewers over vast ecosystems, true to their keystone role. Their cropping of vegetation, often dry and coarse, reduces the possibility for major, soil-sterilizing fires. This cropping sparks vegetative renewal, the re-budding of new and tender shoots of greater nutritional value, especially to ruminants whose digestive and metabolic systems are over-taxed by the coarse, dry vegetation that equids can better handle. And thus the overall productivity of the land is annually increased, as studies prove (Fahnestock, JT and Detling, JK. 1999 [both]). Wild horses form tight-knit stallion and elder-mare-governed bands. Over time, each band searches out and establishes its own home range, which may cover hundreds of square miles annually in drier regions. The ecological mosaic that results among all such particular band home ranges in a given area prevents over-crowding and overgrazing. Once available habitat is filled, the horse, as a climax species, limits its own population as density-dependent controls are triggered. In the immediate future, true wild-equid-containing sanctuaries need to be established. Here livestock should be excluded or at least greatly minimized and wild equids allowed to establish viable populations in the thousands of individuals (Duncan 1992). These fairly populated sanctuaries will be viable in the long-term. They will preserve the vigor of the horses and burros they were designed to conserve. Allow each wild equid herd to fully fill its ecological niche space within each given area bounded by natural or where necessary artificial barriers, and by buffer zones. Then allow each specific herd to self-stabilize, or auto-regulate, its population, within this area. Such auto-regulation can happen if we humans allow. Equids are “climax species,” which is to say, members of the “climax successional sere,” or stage, and do not expand out of control to destroy their habitat and ultimately themselves. Each band within a herd population is usually governed by a lead stallion (patron). He watches out for and defends the band and does most of the breeding. A usually older, lead mare also aids in this role. This mare is very wise as to where the best foraging, watering, mineral procurement, sheltering areas, etc., are located. She leads the band along paths uniting these habitat components. These include longer seasonal migratory routes between higher summering and lower wintering habitats. Both patron and lead mare socially inhibit reproduction among younger members of their band. As resources become limiting, physiological and social responses result in decreased reproduction in any given band or herd (Rogovin and Moshkin 2007). Employ natural barriers where possible, or, where such do not exist, semi-permeable, artificial barriers, where necessary, in designing each wild horse sanctuary. Design and employ buffer zones around the wild horse sanctuaries. Here a gradual tapering off of wild horse presence would occur through the implementation of discouragements to their transiting into areas where danger exists for them, such as in farms or cities. This may involve the use of what wildlife managers term “adverse conditioning” as well as “positive reinforcement”. In order to realize healthy, balanced wild-horse-containing ecosystems, as full a complement of plant and animal species should be allowed. Wherever possible, this should include large carnivores/omnivores native to the region in question, such as the dingo. These will provide an additional limitation on wild horse populations (and wild donkey), one that will act through natural selection to make any given population more fit for survival in the wild and more harmoniously adapted to its particular ecosystem. Bell RHV. The use of the herb layer by grazing ungulates in the Serengeti. In: Watson A ed. Animal Populations in Relation to their Food Source. Oxford, U.K.: Blackwell Science Publications; 1970: 11-125. De Haan C, Steinfeld H, Rosales, M, Gerber P, Wassenaar T, Castel V. Livestock’s Long Shadow: Environmental Issues and Options. Rome, Italy: Food and Agriculture Organziation of the United Nations; 2006. 390. Downer CC. The Wild Horse Conspiracy. 2014. www.amazon.com/dp/1461068983 314. Downer CC. Wild and free-roaming horses and burros of North America: Factual and sensitive statement – how they help the ecosystem. Natural Horse. 2005; 7(3): 10-11. Downer CC. Overgrazing is by humankind. Bulletin of the Theosophy Science Study Group. 1987.; 25 (5, 6): 57-60. Downer CC. Proposal for wild horse/burro reserve design as a solution to present crisis. Natural Horse. 2010; 12(5): 26-27. Duncan P. Zebras, asses, and horses: An action plan for the conservation of wild equids. Gland Switzerland: IUCN Species Survival Commission, Equid Specialist Group; 1992. Fahnestock JT, Detling JK. The influence of herbivory on plant cover and species composition in the Pryor Mountain Wild Horse Range. Plant Ecology. 1999; 144: 145-157. Fahnestock JT, Detling JK. Plant responses to defoliation and resource supplementation in the Pryor Mountains. J. Range Management. 1999; 52: 263-270. Meeker JO. Interactions between Pronghorn Antelope and Feral Horses in Northwestern Nevada. MS thesis in Wildlife Management. Reno, NV: University of Nevada-Reno: 1979. Moehlman PD (ed). Equids: Zebras, Asses, and Horses: Status Survey and Conservation Action Plan. IUCN/SSC Equid Specialist Group, IUCN (The World Conservation Union). Gland Switzerland: 2005. Oxley R, CC Downer. Deserts. In: Hare T, ed. Nature Worlds Macmillan Reference. London, U.K.: Duncan Baird Publishers; 1994: 116. Peck S. Reserve Design. Planning for Biodiversity: Issues and Examples. Washington, DC: Island Press; 1998: 89-114. Rogovin KA, Moshkin MP. [Autoregulation in mammalian populations and stress: an old theme revisited]. Zhurnal Obshchei biologii. 2007; 68(4): 244-267 (in Russian). Williams AR. Horse Power. National Geographic. 2012: 25. Note: This article tells how horses are being used to restore degraded ecosystems in many countries of the world. Zimov SA. Pleistocene park: return of the mammoths’ ecosystem. Science. 2005; 308: 796-798. Thanks for publishing the essay that went with my poster presented to the Ecological Society of Australia annual conference in Alice Springs back in October 2014. I went on to visit many places where brumbies occur in Australia as well as many where they do not occur, and weighing all the great diversity of this vast ecosystem including its diverse people, it does not strike me that the wild horses are the “big destroyers” some people like to say they are. To me this smacks of tunnel-vision and scapegoating, though I am certainly for preserving the native fauna and flora. What people need to recognize is that there is a need to see the life community as ever evolving and adapting. I think the most critical challenge humans face today is in bringing themselves to allow all the diverse plants and animals to establish their own sane balance according to true principles that operate in the natural world, and to respect these and learn to live in harmony therewith. Thank you for your modern and dynamic style of reasoning. Unfortunately not something that any of our Politicians or their so called ‘scientists’ have! An ‘in-depth scientific’ approach to our ecology, inclusive of all the natural and purpose-designed participants in it’s health – a fine balance that mankind would do well to take note of and observe respectfully. The Planet’s health and mankind’s future depend on it. Where is the methodology to support these claims for the Australian landscape? Where is the actual on the ground monitoring of the effects of horse activities compared to areas where horses aren’t found? Counts of flora and fauna species in areas with horses compared to areas where they aren’t? 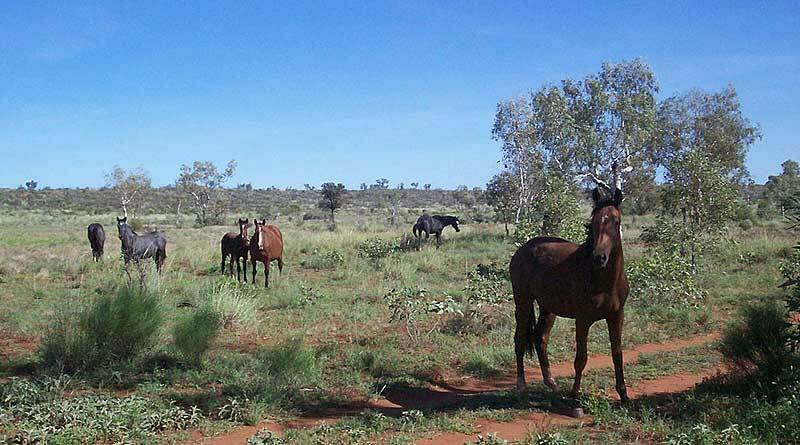 Water testing and species diversity and numbers around horse affected waterholes? Reference to papers that do show negative impacts in similar types of landscapes such as the well documented negative effects of horses in the Kaimanawa ranges of NZ as well as the findings of monitoring projects in the Alpine National Park undertaken by the Victorian NPWS? Unlike the US which had horses until the last ice age and then only a short (in evolutionary time) period without them before they were re-introduced, as well as large herds of other native hard hooved animals such as bison and deer, Australia has no history of co-evolution with such animals throughout its history. The ecosystems reviewed by Downer in this article are of arid zones in the US. These may share some similarities to central Australian ecosystems, but are completely unlike the wet temperate areas such as the Snowy Mountains, Blue Mountains and wet temperate forests of Queensland. Thus to claim that effects observed in arid zones apply to wet temperate and alpine areas can’t be substantiated. In fact, a recent study by the University of Queensland investigating the effect of different landscape types on feral horse hooves showed that horses in arid zones had very different hoof morphology compared to horses living in the Carnarvon area, a wet forest ecosystem and that conclusions about an ideal hoof conformation had to take into account the environment in which the horse lived. Likewise, the behaviour of horses in the arid zone was significantly different to the horses in the wet forest due to the differences in access to water, feed and temperature. Australia has many diverse and unique ecosystems, none of which co-evolved with horses. We have the unenviable record of the highest number of mammalian extinctions in the past 200 years and we will be on track to that if we continue to care more about wild horses than our ancient, fragile landscapes and their endangered animals found no-where else in the world. It is estimated that Australia has the largest population of feral horses anywhere in the world with an estimate of 500,000 across the country. They are in no way endangered and multiple genetic testing efforts have shown there is nothing unique about their DNA. They are simply domestic horses that have either been deliberately abandoned or escaped. Australian horse owners also send between 40,000 and 90,000 of their own horses to slaughter in knackeries and abattoirs every year without the handwringing or romanticising. Attend any local auction and there are plenty of ordinary people willing to chance their unwanted horses to the meat buyers. It is not just horses that negatively impact Australian ecosystems- cats, foxes, pigs, camels, donkeys, deer, rabbits and humans have all had a terrible impact. Hundreds of millions of our money gets spent on trying to control the animals and reduce their impacts. It seems its only the horses that we have a collective blindspot about.